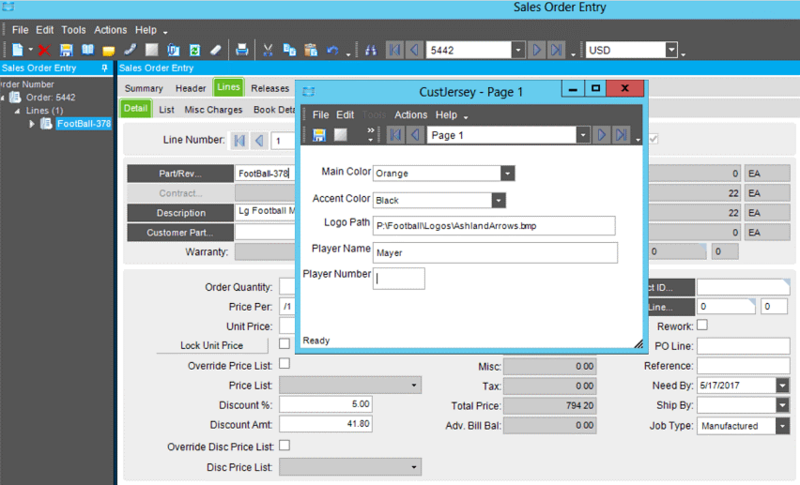 Product Configurator gives you the ability to allow your customers to custom order your product. If your product allows for custom configurations or specifications then you may want to explore the powerful tools that Product Configurator provides. It can be used at the time you’re building a quote, sales order, or a job. Furthermore, it can be integrated with a website allowing your customers to directly customize their order as they’re making it. At PTS, we can help you through any process. Whether it’s building a brand-new configuration, adjusting or improving an existing configuration, or bringing your configurations up to a new version of Epicor®. We’re happy to help you with any of these scenarios, and we have the experience necessary to do so effectively. In need of bringing your Product Configurator solutions over to Epicor® 10? PTS has helped several customers with this. Product Configurator can help your business through your Quoting process, Sales Order product selection and customizing, or at the Job creation stage. 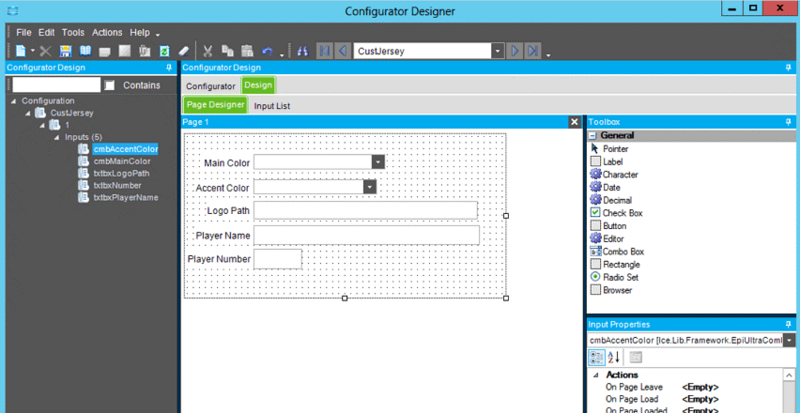 If your product allows for any customizing at all, PTS can help you build Product Configuration solution. We would be happy to coordinate meetings with Sales, Engineering, and Management to map out your product and its available customization selections. We typically map this out in an Excel format so that everyone can “hit the ground running” as usually everyone is familiar with Excel. PTS helps lead your team in building a comprehensive map for all of the possible selections and configurations of your product. Contact us to get started. Example: A simple example is one of our customers specializes in sports equipment. Product Configurator can help in this area for custom made jerseys. It allows for customers to pick the colors they want, the logo for the team, and the name and number of the player. Q. How is this helpful for you? A. Epicor® can accommodate your customers need to customize the product. At the time of order entry, users enter the details of the product being sold. Product Configurator handles the specifics of MOMs, BOMs, and Part creation. All your users have to do is enter in the specifics of the order. Interested in additional customized Epicor® solutions? We can help there too! With years of experience creating custom reports, dashboards, and much more! “The straight forward approach was a relief and I appreciate how the PTS team jumped straight in despite the complex challenges we faced. I was able to speak with Jim directly several times which provided a great amount of comfort, I never had any trouble reaching him and/or a member of his team. The team at PTS assisted in arranging meetings in which we discussed complicated business process and procedure requirements. This sped up the improvement process significantly. PTS’ methodology was a perfect fit to quickly and thoroughly address our needs and provide solutions. The functional results that were produced as a result of Jim’s team were a key component in keeping operations running. Moreover, their skills for development are extraordinary. On top of his work, Jim’s team also provided excellent support. They dealt with questions ranging from the absolute basics to advanced easily and with an air of patience that can only be described as completely forgiving! Disclosure: Practical Technology Solutions LLC is a provider of Epicor® professional services and has no affiliation or partnership with Epicor® or SAP. Epicor® and Vantage® are trademarks of Epicor®. Crystal Reports® is a trademark of SAP. This website link is provided by Practical Technology Solutions, LLC to its prospective customers and clients conditioned on your acceptance of the terms and conditions of use as set forth herein. By browsing, accessing, using and/or downloading information from this site, you agree that Practical Technology Solutions, LLC is providing and you are using the information provided for educational or training purposes and that Practical Technology Solutions, LLC is not receiving remuneration for providing this information. Furthermore, you agree not to sell, reproduce, modify or attempt to modify the information provided nor reproduce, publish or distribute the materials. Unless otherwise noted, all materials are subject to intellectual property rights including copyrights and trademarks held by or licensed to others. In no event shall Practical Technology Solutions, LLC be liable to you for accessing this website.